Once you’ve made the move abroad, you’ll often be feeling a little bewildered. You’re in a strange country; you may not speak the language at all or only a little; you miss your friends and family back home and develop odd hankerings for aspects of British life that you never knew you cared about – a craving for fish and chips, perhaps, or a desire to see Eastenders again. It’s in this context that contact with your fellow British expatriates can make all the difference. How do you meet them? 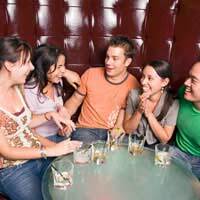 If there are other British people or even just native English speakers at work, you should ask them if they know of any expat hang-outs locally. Otherwise, you can keep your eyes peeled for a Union Jack flying from a pub somewhere as you move around town. Many cities and countries also have English-language publications aimed at the expat community. The best place to check for these is the large newsagents in or around the city’s biggest railway station. This being the internet age, you will also often find web forums dedicated to English-language expatriates in specific locales. Once you’re hooked up with a group of exiles like yourself, you find it a great reservoir of tips and information. You’ll be able to get advice about local professionals – doctors, dentists, lawyers, real estate agents and the like – who are happy to talk in English. You’ll learn anything you need to know about local regulations, whether you need to register with the local authority, how to get a driving licence, and so forth. All in all, your expat haunt may come to seem like a haven from the uncertainties of the world outside. Although undoubtedly they can be great support systems, and serve as conduits for lots of useful information, there are some dangers in expat communities too. For example, they often encourage you to hark back to the past rather than look forward to the future. If you’ve decided to migrate to a new country, you should really make an effort to integrate with the local community. Learning the native language should be a high priority for you. But if you become too deeply embedded within an expat social network, you may find that there is little pressure for you do to so. Everyone in your circle of friends speaks English, so why bother? In addition, expat talk often consists of grumbles about the foreigners and reminiscences about home. While a little of this can be amusing, or even a good outlet for frustration or homesickness, too much of it can have a poisonous effect on your whole outlook. You begin to perceive your new country as something “other”, rather than a community you feel you can belong to. For this reason, if you find yourself falling into a routine of going down to the British pub after work, perhaps watching Premiership football matches on satellite television, and rarely having to speak a word of the local language, you should probably regard it as a rut that it’s best to get out of. The only exception to this might be when you know for certain that you will only live and work abroad for a limited period of time. In this case, since you’ve no intention of putting down roots, it won’t make much difference. When you’re planning or even considering permanent residence in the new country, however, you should avoid walling yourself into a Union Jack-festooned ghetto. Expat communities can be great for staving off the homesick blues. Just don’t get too caught up in them, or you’ll lose out on the experience of living in a new country and culture. Should You Go Work Abroad on Your Own?